Good progress is being made to stop bird trapping on the spoon-billed sandpipers’ non-breeding grounds. Bird trappers sign agreements to cease hunting, in return for small grants to buy fishing equipment. The East Asian-Australasian Flyway Partnership Spoon-billed Sandpiper Task Force estimates that as many as 80-90% of hunters in the Bay of Martaban, Myanmar (the most important wintering site in the world for spoon-billed sandpiper) have now signed an agreement to stop hunting and surrendered their trapping equipment. But even if everything goes well and winter mortality is halved every five years from 2011, population modelling indicated that the population would still be extremely small and highly vulnerable to extinction for more than a decade. Without spoon-billed sandpipers in captivity, there would be no safety net against extinction in the wild. In response to the dramatic population decline observed in the 2000s, a conservation breeding programme was started in 2011 to safe-guard the species in captivity while threats in the wild could be addressed. And, if the worst happened and the wild population was lost, a captive population could provide a source of birds for reintroduction into the wild. Before the conservation breeding programme was started, the project team used population modelling to assess the effect of taking eggs on the wild population. Using the estimated population size and information available on adult survival, productivity and recruitment, the models indicated that any effect would be negligible. A captive population was established in 2011 and 2012 from eggs collected from pairs breeding around Meinypil’gyno village in Chukotka, Russia. The flock is housed in specially-designed biosecure aviaries at WWT Slimbridge in Gloucestershire, UK. Despite all efforts to provide the birds with conditions for breeding, successful breeding has not yet been achieved. But each year the team is getting closer. In 2014, the birds displayed breeding behaviours for the first time. In 2015, these behaviours escalated with many nest scrapes constructed and females responding to the displays of the males. And in 2016, eggs were laid! Unfortunately, of the seven eggs laid by two pairs, only two chicks hatched and both died within days. The team continue to make adjustments and we are hopeful that successful breeding will soon occur and the population will begin to grow. A headstarting programme for spoon-billed sandpipers has been underway since 2012, involving specialists collecting eggs from incubating birds in the wild, hatching and hand-raising the chicks in captivity to fledging age, and releasing the birds back into the wild. 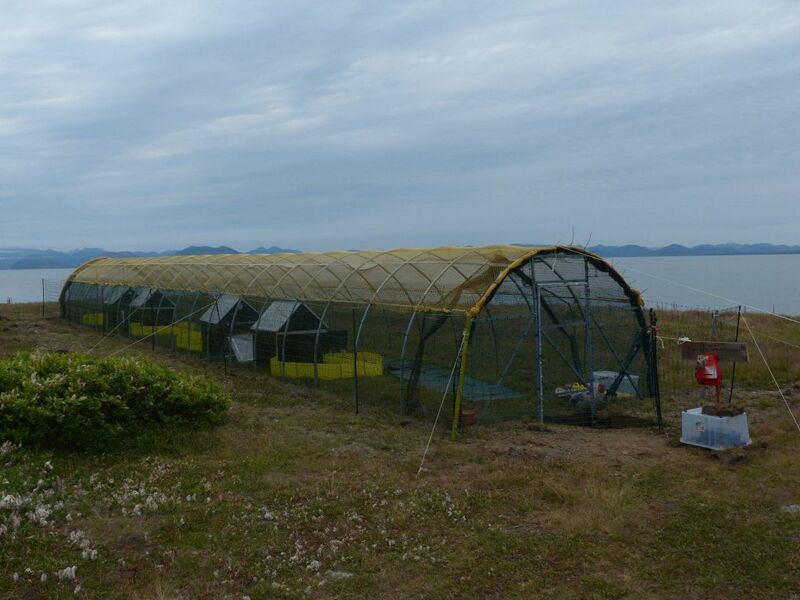 This intervention protects the eggs and chicks during the particularly vulnerable incubation and rearing phases. 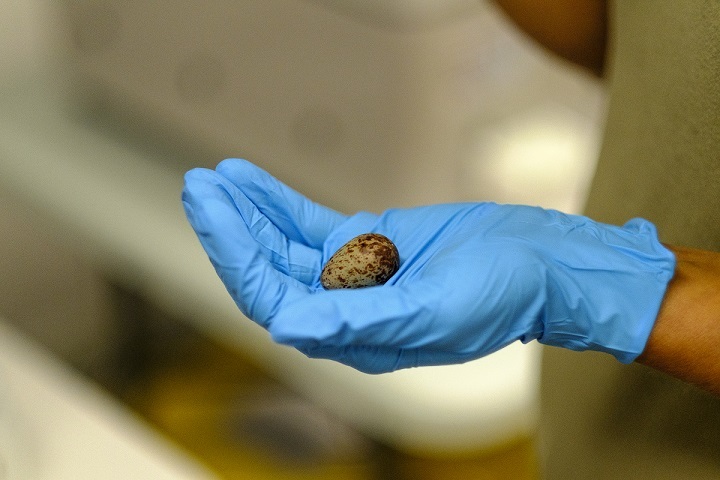 The idea for headstarting was proposed in 2011 following the hatching and rearing of chicks for the conservation breeding programme at WWT Slimbridge. The high hatching and rearing success achieved in 2011 indicated that, with artificial incubation and a brief period in captivity, it could be possible to increase the number of fledglings produced by pairs at Meinypil’gyno approximately five-fold. In the wild, spoon-billed sandpipers produce on average approximately 0.6 fledglings per pair. With headstarting, over 3 fledglings per pair could be produced. The idea was trialled in 2012 with nine birds released (from eggs collected from three pairs, 3.0/pair). The following year, 18 (3.0/pair) were released and the numbers have gradually increased, with 26 (3.3/pair) in 2014, 28 (3.1/pair) in 2015 and 30 (3.3/pair) in 2016. 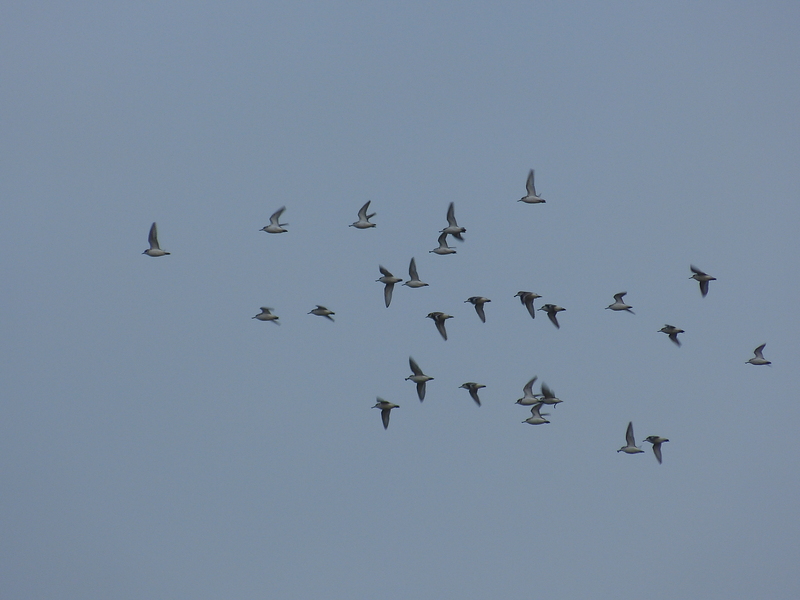 To date, 111 spoon-billed sandpipers have been released at Meinypil’gyno. All but two of the 111 headstarted birds were released with individually engraved leg flags, and these have allowed us to monitor their survival and movements. Over 20% of the released birds have been re-sighted at least once away from the breeding grounds, at 14 different sites throughout the flyway. Thirty (40%) of these sightings have been made on the Jiangsu coast of China, with the other sightings coming from southern China, Taiwan, Myanmar, South Korea, Japan, Thailand and Russia. And the headstarted birds are returning to breed. Ten individuals are known to have returned to Meinypil’gyno during the breeding seasons 2014–2016 and others may have bred elsewhere. 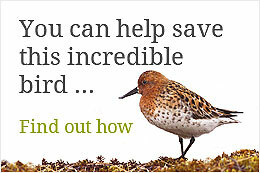 We currently don’t know where 75% of spoon-billed sandpipers breed and where around 25% winter. This seriously hampers our ability to conserve them – if we don’t know the key sites they use, we can’t work to protect them. In Autumn 2016, an exciting new effort began to try to locate some of these “missing” sites. Tiny (1.9g) tags designed by Microwave Telemetry Inc. were fitted to three spoon-billed sandpipers on their autumn staging and moulting area on the Jiangsu coast of China, in the south-western corner of the Yellow Sea. We hope that the tags will transmit for a few months, or even longer, giving new information about the sites the birds use and the routes they take between their staging and wintering sites (probably in Bangladesh and Myanmar). We expect that they will take an overland migration route, but will we be wrong? This amazing technology will, for the first time ever, allow us to answer fundamental questions about spoon-billed sandpiper migration that have been intriguing scientists for centuries. The Yellow Sea coasts of China and the Korean peninsula have been recognized as one of the world’s most important regions for waterbirds, particularly for migratory shorebirds using the East Asian-Australasian Flyway. We believe that almost all, if not all, of the world’s spoon-billed sandpiper population stops on the Jiangsu coast of China – in spring on their way to their Russian breeding grounds and then again in autumn to refuel and moult before continuing their 8,000km journey to their wintering grounds in south-east Asia. Coastal wetlands in China, including Jiangsu, are being reclaimed at an alarming rate and it is therefore crucial that there is sufficient habitat remaining – mudflats for feeding and safe areas to roost – at these critical stages of their life cycle. 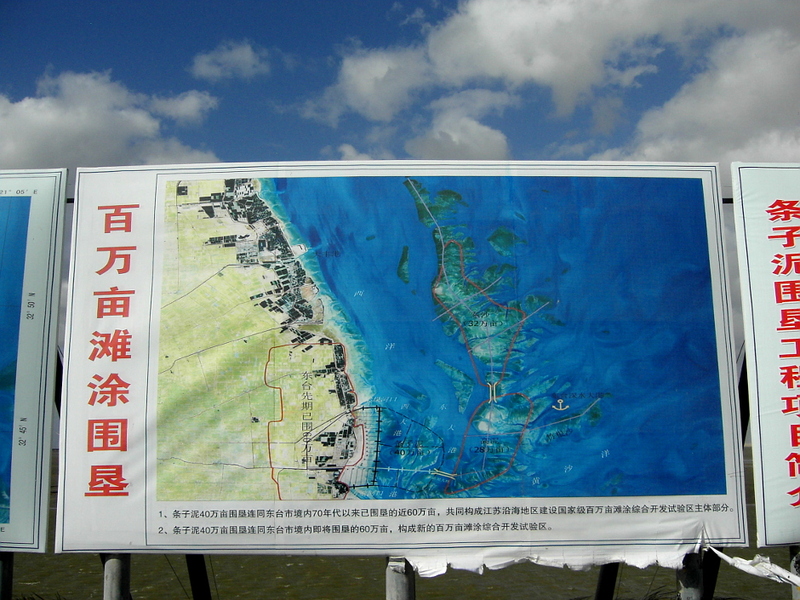 Conservationists and Chinese officials are working together to try to ensure this happens.